A year ago, there was a pervasive mood of gloom among economists and investors about prospects for the global economy in 2016. China was in the doldrums, and fears of a sharp renminbi devaluation were rife. The oil shock had caused major reductions in capital spending in the energy sector, and consumers seemed reluctant to spend the large gains they were enjoying in real household incomes. Deflation risks dominated the bond markets in Japan and the Eurozone. In the US, the Federal Reserve seemed determined to “normalise” interest rates, despite the rising dollar and the weakness in foreign economies. 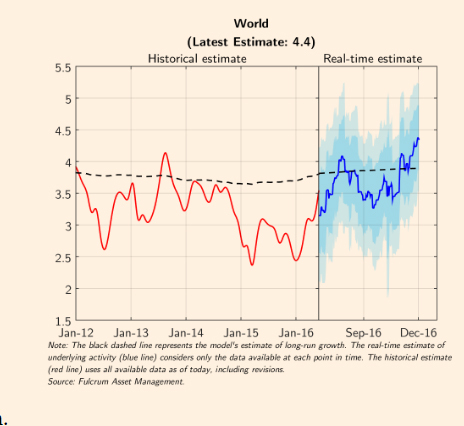 At the turn of the year, there were forecasts of global recession in 2016. 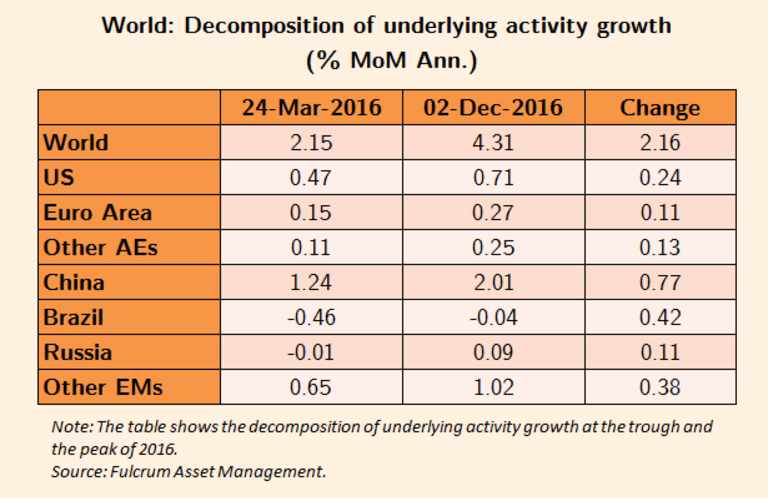 At the low point for activity and risk assets in 2016 Q1, the global growth rate (according to the Fulcrum “nowcasts”) had dipped to about 2 per cent, compared to a trend growth rate of 4 per cent. It was a bleak period. The dominant regime in financial markets was clearly one of rising risk of deflation. 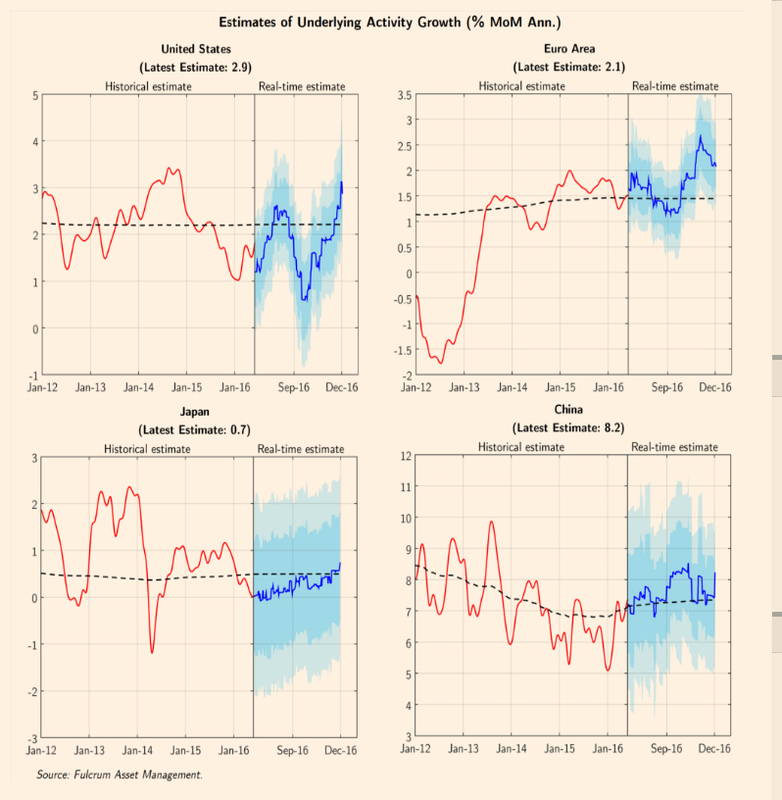 Since then, however, there has been a marked rebound in global activity, and in recent weeks this has become surprisingly strong, at least by the modest standards seen hitherto in the post-shock economic recovery. According to the latest nowcasts, the growth rate in global activity is now estimated to be 4.4 per cent, compared to a low point of 2.2 per cent reached in March. The latest growth estimate is the highest reported by the nowcast models since April, 2011 – before the euro crisis and the China slow-down hit global activity very hard. This relatively upbeat take on the current state is supported by alternative data sources. For example, the Goldman Sachs Global Leading Indicator has just reached its highest point since December, 2010. 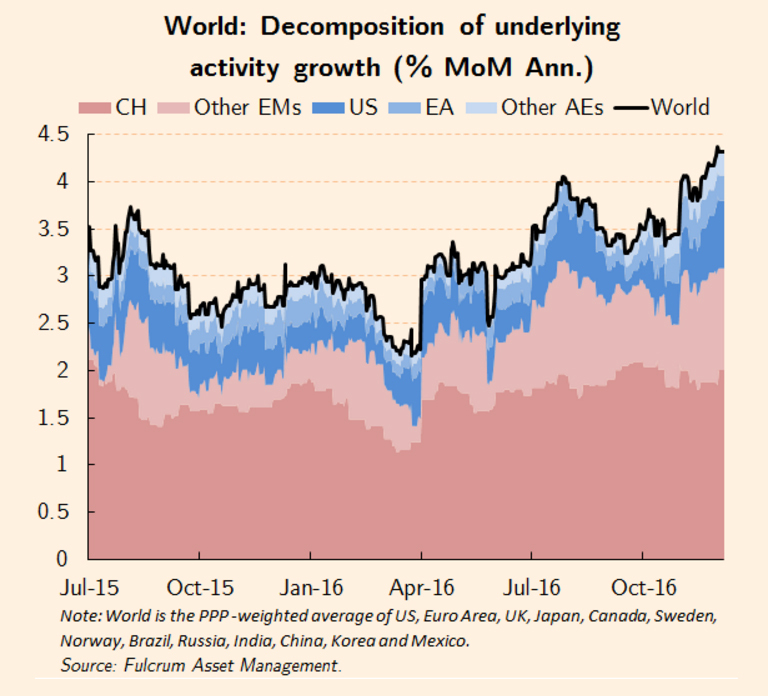 The uptick in global activity growth has, of course, been accompanied by a rise in headline inflation rates in almost all major economies. Recently, I argued that this jump in inflation was still “weak and patchy”, and almost entirely due to the partial recovery in oil prices, which has been taken further this week by the market reaction to the OPEC decision to reduce oil production. However, the bond markets have taken the reflation trade increasingly seriously, in part because of the assumed shift towards fiscal easing after the election of Donald Trump in the US. Although the case for a rise in core inflation in 2017 (as opposed to headline inflation) is far from convincing, the recent rebound in global activity may well give the “reflation trade” a further leg upwards. In the past few years, economic activity in the major regions has not been synchronised. There have usually been one or more sources of geographical weakness that have dragged down the global aggregate. Based on PPP weights, China alone is contributing almost half of the total growth in the world economy, with the other emerging economies contributing a further quarter. That leaves about a quarter coming from the AEs, of which more than half stems from the US. Europe and Japan are making a negligible contribution to global growth at the present time. All of the contributions are positive, indicating that the improvement in growth has been widespread in the global economy. But the largest contributions to the improvement have once again stemmed from the EMs. China alone has contributed 0.77 percentage points of of the 2.16 points improvement in the global total. Other EMs (especially Brazil and Russia) have contributed 0.90 points, while the AEs have contributed 0.48 points, half of which has come from the US. Again, the contribution from Europe and Japan has been very small. Can this improvement be sustained? Attempts to forecast inflexion points in global activity a year or two ahead are not very accurate. Having said that, there are some reasons for optimism that the firmer tone currently identified in the nowcasts might persist during 2017. 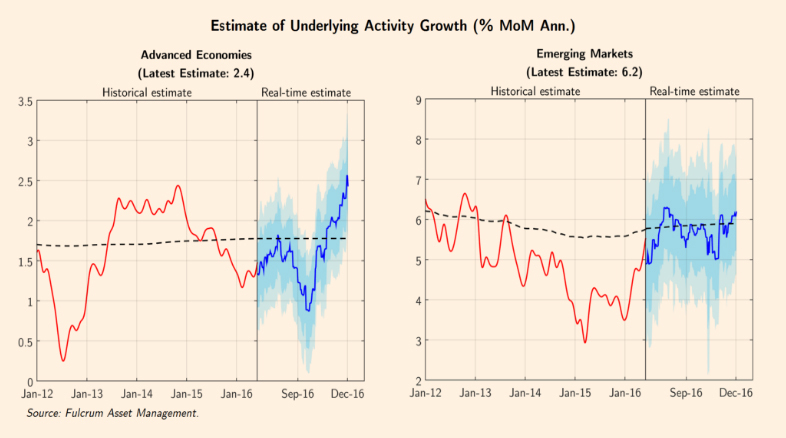 As noted above, the main reason for the recent uptick in global growth has stemmed from the EMs, notably from the major easing in fiscal policy in China, and the flattening in deep recessions in Russia and Brazil. The main downside risks to growth prospects in the EMs are a return to tighter credit control in China and an outflow of capital as an aggressive tightening in Fed policy pushes the dollar higher. These risks need to be watched, but do not seem imminent. In the AEs, fiscal policy is being eased, monetary policy is still accommodative and the manufacturing sector is gaining from firmer corporate investment as the energy shock dissipates. These developments may lead to an upgrade to growth forecasts in the AEs for the first time in many years, provided that a major shock to confidence can be avoided from a shift towards populism in elections in the Eurozone next year. Overall, we can perhaps be hopeful, though certainly not yet confident, that the global economy will begin to overcome the powerful forces of secular stagnation next year. We use PPP exchange rates to calculate the weight of each region in global GDP, a procedure which has the effect of increasing the measured contribution on the emerging economies, compared to using market exchange rates to calculate the weights.